Here are some video demos setting up a game of Allfield and now actually playing a sample round. These videos, along with the free print and play, full directions, and limited print preview decks, you have everything you need to get rolling. On this page you can get one of the limited preview decks designed for testers and reviewers. You can use the contact page to send me game feedback and see how you can further be a part of Allfield world. As I get more Allfield videos, or players publish their adventures online, I will feature them on my YT channel. Here is a glimpse into the process of how I made promotional preview decks of 60 cards. 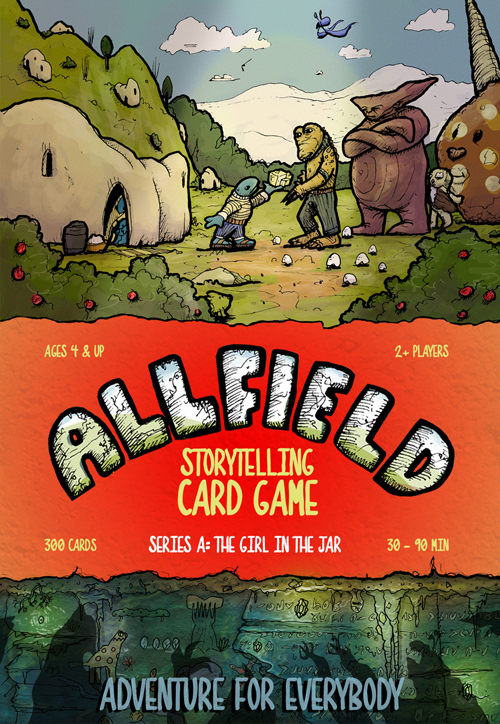 The Allfield Storytelling Card Game is made up of 300 cards. While I want people to have the whole thing in their hands as soon as possible, it is too expensive a task to create them as promotional items. Therefore, I selected 60 cards for the print and play as well as a limited physical preview decks for reviewers, stores, and gaming groups. Picking 60 cards out of 300 I wanted to see printed and complete was a hard chore in itself! I went with offset printing and printed them with Oswego Printing in Oswego, NY-which is only about 15 minutes away. I have room for storage but I wanted to spread out and collate some decks for boxing. This wasn’t going to happen in my studio, which I thought was big, but not for a project of this size. Therefore, I headed to Artistree Studios during Open Studio time and spent several hours making deck piles on the tables. Here the ink and uv varnish still smelled fresh on the cards. A lot of cutting and gluing! Locally I don’t have many options for printing die cut packaging, so I braced myself for finishing the next step on my own: packaging. First I measured the deck’s thickness and other dimensions. From there I used pencil, paper, and my trusty ruler to design a box that would fit the cards. Another big step was designing and adapting graphics in photoshop. These are preview decks, so I am not thinking about bar codes or any of that yet. I went with a big name office supply store to make some color copies on card stock. The next step was cutting, scoring, folding, and gluing by hand. I didn’t want to shrink wrap these so I bought some round removable sticker labels and used those to hold boxes closed. A small box of preview decks ready to go! That’s it! I have many, many more decks and boxes to put together, but I hope this was interesting, or helpful-either in terms of what I did, or learning from what I should do better next time! If you’re interested in being a reviewer of Allfield and want to get your hands on a preview deck of your own, you can find and order them on the right side of this page! Soon I will be posting information on an upcoming Kickstarter to print the full 300 card games, release the full length graphic novel of part 1 in Allfield titled “The Girl in the Jar”, and even a full musical soundtrack by Bert Jerred. There will be digital assets for online gaming sites such as Roll20 or Tabletop Simulator, and even an in-browser Allfield game. Right now there is a preview of the comic on this site, as well as directions and a print and play for the game which are all now available to anyone. If you like what you are seeing here, please share it! 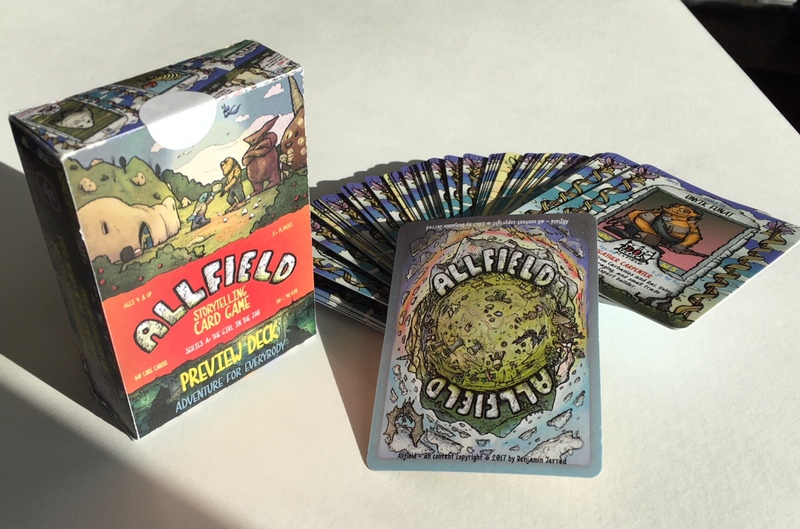 ALLFIELD is a versatile collector card game where the deck is the world, and you decide what to do-alone or in teams, collaboratively or competitively. Download the Print and Play, or Get Your Own Preview Deck! Click here to download free Print and Play PDF now. Please let me know if you have questions or feedback! Allfield is appropriate for people of all ages. It’s got loads of cuteness and fun things to do, but it’s also full of mysteries, weird monsters, and troublemakers. You and your team must rely on your quick thinking and imaginations. Most tabletop role playing games require extensive references and calculations, with only one person acting as a game manager who designs the overall experience. However, Allfield acts very similar to how children play pretend, with just enough structure to make it a storytelling game. This creates an exciting and unpredictable world while providing creative freedom and collaboration to balance story ownership between all players. Use cards and your imaginations to create an adventure story that everyone participates in. Players take turns in three different roles: The Storyteller, the Allfielder, and the Teammate. The game is over when the players feel like the chapter or story has ended! It can continue for as long and for as many sessions as you want. The Dealer shuffles cards and deals each player 5 cards. Character Cards: If a player has a desired character card in their hand, they lay it on the table for everyone to see. This is their Character card. A player has one Character card at a time. A player can swap it out at any time if dealt a character card that the player prefers. Players can make up their own back story and even change their name if they want. But this has to be explained to the other players. (Players can also choose to use an Animal card as their player, which is fine. A player’s character card can be anything they choose, if they can make it work!) Players might not yet have a card they’d like to use for a character (see Missing a Turn, step 9). Mod Cards: Players can upgrade their character with Mod cards. The player can lay down up to 2 additional cards from their hand at any time which increase the capabilities of their Character. These “Mod” cards can be any card in the deck (Except Yaial cards, see Reviving Characters step 14). You can swap these out throughout the game as desired. A player can have a maximum of 2 Mod cards for their Character at any time. If a player has a character card as a Mod card, they cannot control that character, but instead benefit from the details and resources of that character. Introductions: As players lay down and introduce their Character and/or Mod cards, they need to be explained to the other players. Remaining cards are held in players hands for now (see Surprise Cards, step 7). If a player does not yet have a desired Character to lay down, the player holds on to their cards for now (see Missing a Turn, step 9). The first round is ready to begin. Play moves to the left of the dealer and counterclockwise through the players. Introducing a Story: The first player is the Storyteller. The Storyteller uses their imagination and an optional card drawn from the top of the deck to describe an opening scene in which all players are together. The Storyteller cannot determine what the players do or think. The Storyteller can describe what players see, hear, smell, and feel. The Storyteller assumes control of any non-player characters introduced into the story. The Storyteller can describe where players are and what is going on-or at least as much as the Storyteller chooses to reveal. Are you introducing a mystery or conflict, or simply a place to explore? If other players ask questions, the Storyteller chooses to answer as much or as little as they see appropriate. The Storyteller does not use their Allfielder card during their turn as Storyteller. The Storyteller is the manager for the turn and directs the story. Dealer Check: At the beginning of a turn an Allfielder needs 5 cards total (between what’s laid down and in their hand), so the Storyteller needs to deal them the number of cards to make that happen. An Allfielder may exhange any number of cards as well, and must be done at this time. The Storyteller deals up to once per turn. Action Begins: The Allfielder listens to the story. Two important things Allfielders can do during their turn is ask the Storyteller questions (exact answers are not guaranteed), and narrate what they want to say or do. This can include talking to or working with teammates. The Allfielder has whatever resources they discover in the story or in their Character and Mod cards (For example, a “Purdine” can light up a dark room, or “Quiet Command” lets you influence the behavior of animals). Allfielders may also draw upon help from their teammates. Teammates are the other players who are not currently a Storyteller or Allfielder during this turn. The Allfielder talks and asks questions and narrates actions they wish to attempt. Allfielders cannot determine any external activity or player outcomes in the game-only attempt things. The Storyteller determines outcomes (see Step 10). ﻿Surprise Cards: Teammates can throw 1 Surprise Card at any time into a round of play. Only 1 may be thrown per turn. Surprise Cards are not compared and decided on based on merit-whichever Teammate throws a Surprise Card first locks out the other Teammates for that round. Teammates may discuss among themselves but once a card is thrown it is final. The Surprise Card can be used to help or harm the active Allfielder, and must be incorporated into the story. ﻿Missing a Turn: If it’s an Allfielder’s turn and they do not have a Character card to play with, and after re-dealing up to five new cards, still doesn’t have an active Character card to play with, the Allfielder must forfeit their turn until the next time around and the play moves on. On their next turn they can attempt re-dealing again. However, it is legal for players to agree for a Teammate to swap a character card in from their hand so the Allfielder can play, even if the Allfielder has been re-dealt cards for that turn. ﻿Determining Outcomes-Simple actions: Some actions an Allfielder wants to take may be simple, and the Storyteller must decide the success or failure of the attempted actions, and narrate the details of those results. In these cases of minor storytelling choices, the Allfielder’s turn will continue. The Storyteller decides whether or not the attempt is a “Simple” one to judge. Rotating to the next Allfielder: When the turn is over, the Teammate to the left of the Allfielder becomes the the new active player Allfielder. The Allfielder whose turn just ended becomes the next Storyteller. The story continues, repeating steps 5 through 12 with players rotating through role of Storyteller, Allfielder, and Teammate. This continues from player to player for several rounds until the players agree to pause the story or the story reaches a conclusion and the game ends. ﻿Fair Play Considerations: The Storyteller for each turn also serves as final word and ruling judge in two types of situations: 1. player disputes and 2. after fair discussion, if a player is trying actions that are far beyond their ability and risk ruining the game (exaggerated abilities with no basis in story or card-defined resources). Having said that, judges are different for each turn, and imaginative problem solving is the heart of the game, as is fun. Players are encouraged to re-interpret the possibilities of what resources their cards describe, and use them in unconventional ways. Storytellers should not stop this. Also characters can cooperate in the game or decide to turn on each other. The judge needs to rule in terms of character resource, not whether or not a player is doing exactly what everyone else wants. ﻿Reviving Characters: If a player gets three strikes during a game they are out. Either the game is over for them and that character, or if an Allfielder or Teammate decides, there are currently two methods of reviving a character. 1 is an Allfielder using the Knowledge Card of Deadthought, which can revive the character as a ghost. The revived ghost can play again, but cannot use Mod Cards. 2 is when an Allfielder uses the Yaial Card, in which case the revival takes up the Allfielder’s entire turn, and the revived character comes back into the story with normal rules again. It is up to the members of each game and should be decided ahead of time whether or not revival is allowed as a matter of preference, but it is perfectly legal. Roll a 1 – Strike: Your idea doesn’t work and you get a strike. Roll a 2 – Complication:You tried but somehow made it worse. Roll a 3 – Second Chance: Your idea doesn’t work, but you get a second chance to try a completely different idea. Roll a 4 – Changeup: The story takes a sudden and abrupt turn. Roll a 5 – Assist:Your idea will work if you can convince another teammate to help you by throwing a surprise card. If everyone refuses to help, player gets a strike. Roll a 6 – Success:Your idea is successful and you get to draw a card from the top of the deck as a reward. This card stays on the table as a “spendable” Mod card. If and when you use its resources-it is then discarded. Develop and experiment with new gameplay modes like Collector mode where players develop and master skills to build collections and knowledge of the world; Battle mode where players focus on combat and overcome obstacles, fight way through game and defeat opponent(s) or teams to win; Explore mode where players develop their characters to only to unlock and explore new places, charting a path through the world into new areas; Trade mode focusing on collecting and trading with one another; Hunter mode where players capture, defeat, tame, or catalog wildlife they encounter throughout the game. Come up with your own card game using Allfield Cards, then submit your rules and ideas for other players to try. “Place: Building” or “Place: Territory” cards can hold another card, boosting the amount of Mod cards to up to four. Storytellers can adapt rules how they see fit, and teammates can talk freely, although Allfielder has player action control during their turn.